I've been very successful in my life and in my business careers the past 40 years. It doesn't happen by accident. You need to develop and expand on certain character traits to become the kind of person who can create the success you dream of. I promise you, its well worth the effort! Affirmations and motivational tools are all wonderful resources to have and use daily. But you need to do more... to read all the self improvement books you can to learn how to be a better character of person who has learned the skills to craft a better life for yourself. Bottom line, you need to get to know yourself, your strengths and weaknesses. What are the areas and things that make you fall down on your knees? What are the things and the attributes that help you to keep getting right back up again? Learn about yourself. Learn what makes you tick. Then improve on them so that you can count on more consistent results from yourself. Once you develop this life skill you are better able to predict your success in achieving the goals you set for yourself with much greater accuracy, and therefore you can set your goals with OPTIMISM, knowing you have a pattern of achievement already, and have solutions and put supports in place for your areas of weakness. There are certain character traits that would benefit you immensely if you took the time to develop them. Consider the people you admire the most in the present and from the past. How would you describe them? Could you adopt the same characteristics that make them so successful and admirable? You can predict someone's success by their ability to persevere. If you give up easily, you're going to struggle in life. Perseverance also promotes stability and consistent progress. Learn to deal with emotional discomfort and obstacles. There are few characteristics that are more valuable. You probably have at least one friend that's unreliable. You never know for certain if they're going to keep their word. They're either forgetful or have a million and one excuses that you know aren't true. Be a reliable and trustworthy person. Good things frequently happen if you expect them to happen. When you expect the worst, you often receive the worst. Optimism is good for your mental health and is attractive to others. Keep a positive mental attitude at all times. Ask yourself, "What's the best that can happen in this situation?" So many of life's challenges can be avoided easily. When your car has 200,000 miles, it's going to break down sooner rather than later. If your company continues to have poor financial results, people are going to be fired. The writing is often on the wall. Avoid challenges instead of reacting to them. A little courage can change your life. It's amazing how kind the universe is to those willing to stick their neck out just a little. A 5% increase in courage can double your results. There are things in life that are unenjoyable, but necessary. Those who are willing to do these unenjoyable tasks are rewarded handsomely. If it needs to be done, have the self-discipline to get it done. You'll pay the price sooner or later if you don't. When you're willing to give part of your time, money, and attention to others, you receive even more in return. Others appreciate your help and will return the favor when you need it the most. You'll also feel good about yourself and acquire new allies. Be generous when you can. Think of one place where you can donate your time or money and make plans to contribute one or the other. Most of us either have available time or money. Give what you can. Always be acquiring new information and skills. It's one of the few ways to increase your value to the world. The more you learn, the more you can impact the world. Learn something new each day. No one is perfect 24/7 and no one can live up to your expectations every minute of the day. Forgiving others is kind and good for you. Holding a grudge is uncomfortable and serves no purpose. Forgiving doesn't always mean giving the other person a second chance to mistreat you. It means that you no longer expend emotional energy on the situation. Take a personal inventory of these qualities and see how many you already possess. 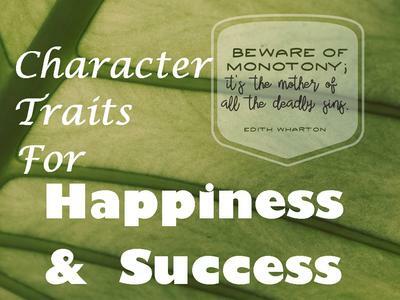 What additional character traits would you like to develop? Humility? Tolerance? Curiosity? Make a master list of the character traits you need to be happy, successful, and proud of yourself. Give these traits the time and attention needed to develop them fully.